Get involved with student philanthropy at the University of Houston! Student Philanthropy at the University of Houston is a program that gives students a better understanding of the role philanthropy plays at the university. It is intended to educate, engage and excite current Coogs about the importance of supporting UH after we graduate. Our goal is to build a culture of philanthropy on campus so that we may continue to support UH as young alumni and into the future. By educating and engaging current students from freshman to senior year, students will leave UH with a better understanding of the importance and impact of giving back. Are you graduating? Don’t forget to take the Cougar Graduation Challenge! 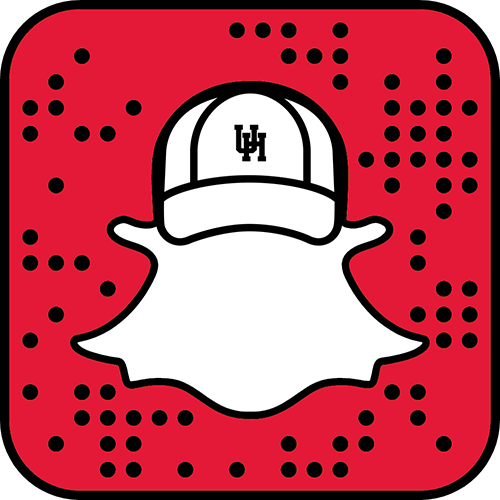 Cougar Cents is the University of Houston’s student fundraising program that helps you support UH one cent at a time. Every contribution counts and has a meaningful impact. Your spare change adds up and makes a difference in the resources and opportunities that are available to current and future students. Phil (the Philanthro-Pig) is the philanthropy mascot for UH and the ringleader of the Piggy Smalls Squad. He supports UH one cent at a time by spreading awareness about the benefits of giving back to the University. He loves to meet and interact with students. You may see him on campus, in class, or at events like Homecoming and Frontier Fiesta! Follow his social media to Find Phil and his squad! 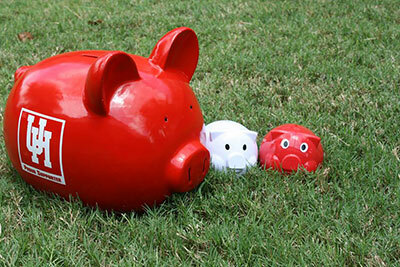 The Piggy Smalls Squad is Phil’s group of miniature piggy banks that are adopted by students. Each Coog is encouraged to feed their pig spare change and drop off fillings at various Philantro-Pig Drops. Check Phil’s social media pages to stay informed about when and where Pig Drops will take place. The Cougar Graduation Challenge is the beginning of a lifelong tradition of annually supporting the University of Houston. Every year, graduating Coogs get together to achieve a participation goal through at least one of the following philanthropy projects: The Cougar Spirit Cord or The Grad Challenge Survey. If you’re a senior, now is your chance to give back to UH! You can give back to any part of the university you choose – scholarships, your school, your favorite sports team, your student organization. It takes just a few moments to be on your way to creating a big impact. Your gift today will provide current and future Coogs with the same resources that we have received through gifts of alumni. Show your Cougar Pride – Demonstrate your thanks and to recognize all the professors, staff, and memories that made you who you are today. Pay it forward – Just as gifts from UH alumni contributed to your education, your support helps unsure future students have a chance to experience the same opportunities you enjoyed, if not better. You have the opportunity to support the part of UH that’s most meaningful to you. Increase the value of your degree – your gift helps boost UH rankings in US News and World Report. Be part of something BIG – alumni giving makes a difference every day. Save the Date! Philanthropy Day is November 15,2017! Philanthropy Awareness Day is an event focused on celebrating contributions to the University of Houston.Every year the University of Houston depends on the generosity of donors who help support scholarships, programs and spaces for innovative learning opportunities. We know the cost of tuition continues to rise, but because of the selflessness of these donors, the University of Houston continues to rise above the rest. Join us for the next Philanthropy Awareness Day on November 15, 2017 at the MD Anderson Library from 11:00 AM – 1:00 PM. Why is Philanthropy Awareness Day important? Alumni participation in giving is considered in university rankings, like those they publish in U.S. News and World Report for alumni, just choosing to give is important.